Many people who are interested in Mala beads and Mala jewelry and who know of the different variations available often have one single question: with all the variations out there, how do I know which one is a good choice? Of course, you can always choose Mala jewelry based on what colors or gemstones you like or are attracted to, or what shapes you prefer. But you can also select Mala beads based on your spiritual journey and your aim or intention in the long run. Alternatively, you can base your decision both on your intention and your preference as well. So how can you be sure that the Mala beads you choose are right for what you want and what you need? Here’s how you can select the best Mala jewelry for your needs. 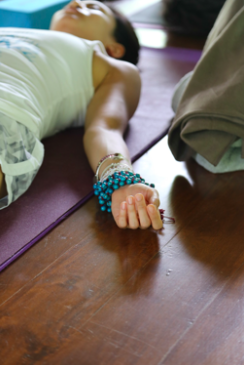 A singular approach to selecting the proper Mala beads is with the use of your intuition. Don’t we have moments when we feel that something is just right for usas if there is a light that suddenly goes on in our heads? Well, if you’re looking at Malas and suddenly feel that one of them is drawing you to it, then listen to your intuition. This could be your inner self giving you a sign that the Mala is right for you. When the message is loud and clear, you will know. And even if you aren’t exactly as sure as you’d want to be yet, what you can do is leave off on your decision for a while. Sleep on it or give it a few days. If you wake up the next morning and you still can’t stop thinking about that particular Mala, then it may be a sign to go for it. You can also base your decision on your intuition by choosing the Mala that your eye is first drawn to – mark it in your head and see if you are still thinking about it later on. Another way to choose Mala beads – a more significant way, perhaps – is to select them based on your intention. But first, you have to work out what your intention is, and find out for yourself what you have as your goal or objective. Every individual’s intention is highly personal, and you can decide for yourself which goals or objectives you would like to accomplish. For example, do you want more abundance in your life? Are you looking for true or eternal love? Do you want more inner peace and healing? Do you think you could benefit from grounding or from a more balanced and definite purpose? To find out your intention, ask yourself what you want to create in your own life and what you are working on, professionally, spiritually, or emotionally speaking. You can also ask yourself what your challenges or struggles are, and this can help you determine your intention. By finding your intention, you can choose Mala beads which have the energy you need to achieve that intention. It makes sense, for instance, to choose gemstones in your Mala which coincide with your aim or goal. If you want to find your true love, then you can go for Mala beads with a gemstone such as rose quartz. If you want to find new beginnings, you can choose another gemstone which can help you achieve this as well. Aside from the gemstone, you can also choose your Mala depending on the sacred materials used to create it. Sacred materials include rosewood and sandalwood. Rosewood is known for its qualities for protection, while sandalwood is known for its meditative and calming qualities.